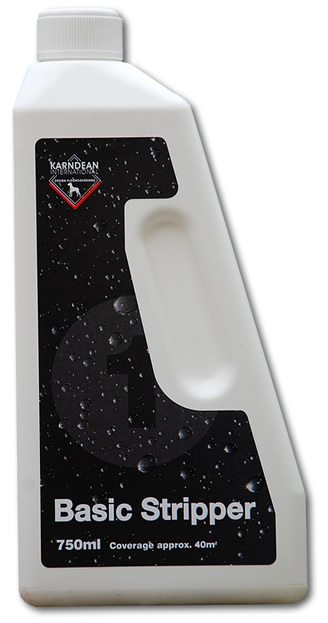 Karndean Basic Stripper can be used to remove adhesive residues after installation or can be used prior to cleaning applications to remove scratches. It is important to apply Karndean Dim Glow after using Karndean Basic Stripper on your floor. This will help protect against scratches and scuff marks. 1. Dilute Basic Stripper approximately 1:5 with water (200ml to one litre of water – covers approx. 10m2). Spread solution liberally over the floor with mop. 2. Leave to work for approximately 5 minutes. Do NOT allow the wet floor to become dry before stage “3”. 3. Scrub the floor with the blue applicator and green pad. 4. Remove residue with mop, then rinse thoroughly with clean water. Important: Karndean Basic Stripper should NOT be allowed to dry on the floor. While applying Basic Stripper wear rubber gloves. For the removal of stubborn marks, use Karndean Basic Stripper undiluted. Please ensure green pad is always wet when in use.